A classic veggie combo — misir wot, gomen, kik alicha, atakilt, and a salad topped with buticha — being shared at Cafe Romanat. To the delight of vegans and vegetarians everywhere, the so-called “veggie combo” is a staple at Eritrean and Ethiopian restaurants in the Bay Area and beyond. The balanced, affordable platter is a blessing to those who have difficulty deciding what to order, and to others who want to sample a good fraction of an unfamiliar menu. But what most Americans don’t realize is that the dish itself wasn’t originally created to function as some kind of generic sampler platter. Although the average Eritrean or Ethiopian couldn’t tell you exactly how these fasting rules came to be, at least 40 percent of the countries’ respective populations are Orthodox Christians — many of whom abstain from meat and animal products for as much as two-thirds of the calendar year. As a result, fasting, or tsom, is an intrinsic part of life. In Ethiopia’s capital, Addis Abeba, for instance, it’s not uncommon for Orthodox-owned businesses such as butcher shops to close on fasting days, and for cafes to not stock milk and restaurants to opt for a tsom-only menu. In Eritrea and Ethiopia, tsom food is abundant in vegetables and legumes that address the fasting diet’s protein gap. When you order yetsom beyanetu at a restaurant there, the star of the platter is the timtimo or misir wot, a lentil stew with a berbere and onion base. The typical platter might also include kik alicha, a split-pea stew that’s rich in garlic and ginger; hamli or gomen, which are uncomplicated collards greens; and shiro, the chickpea-flour stew that sheds its indulgent butter and minced-beef supplements during fasts. Beyond these standard items, restaurants in Eritrea and Ethiopia will add whatever other vegetable dishes they have available as a part of their tsom platters. But here in the East Bay — and at most Eritrean/Ethiopian restaurants in the U.S. — the veggie combo almost always consists of the same four or five classic dishes. You see this focus on meat built into the very history of Ethiopian restaurants in this country. In 1978, Mamma Desta, the first Ethiopian restaurant to gain prominence in the US, opened in Washington, D.C. The restaurant’s first newspaper review shows that Mamma Desta didn’t serve a single vegetable dish at that time. Two years later, when Blue Nile, the East Bay’s first Ethiopian restaurant, opened in Berkeley, an Oakland Post review only speaks of meat and fish dishes served on injera. Fast forward to today, and the veggie combo has become one of the most popular orders at Ethiopian and Eritrean restaurants around the country. As Tamirue put it, “That’s [Enssaro’s] biggest selling item. It’s what we eat every day. We put our heart and soul into it.” She admits that the meat dishes don’t generally take a lot of effort to make whereas tsom food takes more labor and a long list of ingredients. The sheer variety of creative fasting dishes could easily pack a whole menu. At Anfilo Coffee (35 Grand Ave., Oakland), owner Dagmawit Bekele and manager Ambessaw Assegued rotate six or more tsom dishes as a part of a lunch buffet in which lentils and split peas are the mainstays. Sometimes they’ll even include a seasonal pumpkin wot that’s eaten in certain parts of Eritrea and Ethiopia. “You can have a buffet [to the walls] with just tsom food,” Bekele said. In the East Bay, where Eritrean and Ethiopian cuisines have been a constant presence for nearly four decades, it’s due time for restaurants start experimenting beyond the expected offerings, if only to set themselves apart from their competitors. Perhaps some ambitious chef might consider serving siljo — a creamy and aromatic mix of fava bean flour, safflower milk, and spices. It’s a dish that takes time and muya — true skill — to prepare. Or who will offer the simpler dishes that reflect the religious values of humility and simplicity in Orthodox fasting? Fitfit, for example, is a modest dish that combines vegetables, legumes, or seeds cooked in a broth and mixed with morsels of injera that soak it all up. Hagos says she’s excited about the idea of a tsom-only restaurant where she can make varieties of fitfit and other dishes fresh daily with the spices she imports from Ethiopia. And Tamirue, who lived in Ethiopia until the age of eleven, is enthusiastic about approaching the dishes her mother taught her how to cook with a fresh eye. If you’re feeling up for a little change, here are some harder-to-find tsom items currently offered at Eritrean and Ethiopian restaurants in the East Bay. 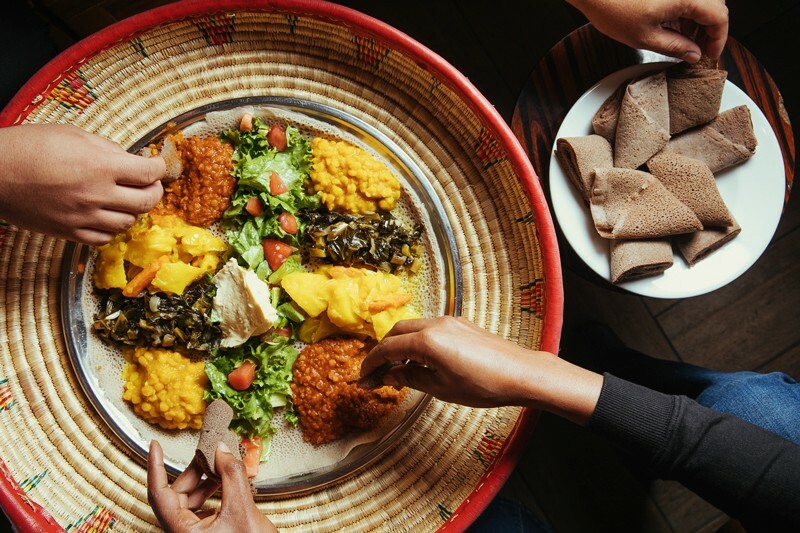 Injera’s chef Aron Haile wanted to create a tsom counterpart to dulet, a delicious and spicy treat that normally consists of finely cubed sheep’s stomach and liver that are spiced with mitmita and cooked lightly in clarified butter. It turns out that mushrooms are great substitutes that replicate the texture and absorbent quality of the original ingredients. Sprinkle extra mitmita on this surprisingly rich vegan appetizer to get even closer to those traditional dulet flavors. To my knowledge, Red Sea is the only East Bay restaurant that has bamiya, an okra stew that is a regional specialty of Eritrea and northern Ethiopia. Variations of the stew found across the Middle East and Egypt often feature lamb. Red Sea’s bamiya is moderately spiced with berbere and, like their other tsom dishes, is served with injera. You can enjoy it as part of Red Sea’s lunch buffet or as an entrée. The buticha that is most commonly served at East Bay restaurants has a texture that resembles hummus, which makes sense given that chickpea flour is the main ingredient. Local restaurant owners say this form of buticha is the most efficient way to prepare the dish en masse, allowing them to drop a dollop of it next to the fresh salad offerings of the veggie combo platter. What sets Messob’s buticha apart is its more traditional preparation: Chickpea flour and water are cooked down into a scramble of sorts that still packs the punch of the lightly cooked onions and jalapeños found in other versions. As the joke goes, Messob’s buticha might have you asking the waiter what scrambled eggs are doing on your tsom platter. The only reason that Alem Coffee’s injera fitfit (listed on other menus as banatu or firfir) isn’t the best breakfast dish served at the cafe is that it’s upstaged by the deserved popularity of the fava bean dish known as shihan phool (which can also be ordered tsom-friendly by omitting the feta cheese). Alem’s fitfit is served in a sauce so uncomplicated that it’s frustratingly hard to replicate. Onions, tomatoes, and garlic cooked in berbere with chopped jalapeños added at the very last minute. Like the rest of Alem’s offerings, it’s a practiced mastery that turns simple ingredients into a standout breakfast dish with an unmistakable homemade quality. Anfilo’s suff and telba drinks are quintessential Eritrean and Ethiopian beverages featuring simple ingredients and numerous health benefits. Suff, or safflower seed, is a multipurpose ingredient in the two countries’ cuisines and is especially popular during tsom. Similarly, telba, or flax seed, wears many hats, including as a savory base for an injera salad. At Anfilo, the seeds are heated up and made into powder, then mixed thoroughly with water and sweetened with honey to create what are best described as “seed milks.” They’re a smooth and refreshing beverage day or night.